This photo was taken on the Westminster Bridge which crosses the Thames River in London, England. The location is popular for capturing the Palace of Westminster and the famous Elizabeth Tower (also known as the Clock Tower or, more erroneously, Big Ben). Daytime shots from this location require additional creativity, since the passing cars don’t really add to the composition of the image. 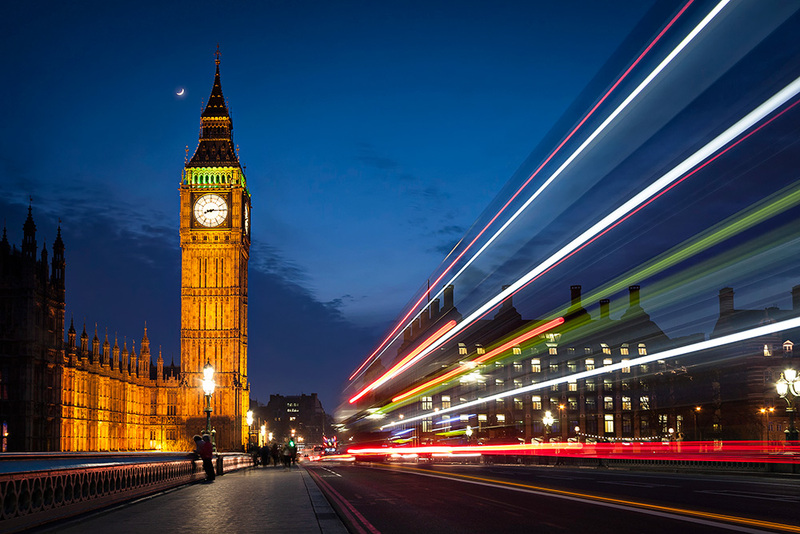 At night, however, you can capture the light trails from passing double-decker busses which adds movement to the image and creates leading lines, drawing the eye towards the Elizabeth Tower. In low light like this, you’ll have to have your camera mounted on a tripod to keep from having a blurry photo. Your shutter speed will have to stay open for several seconds (in this case, 4 seconds) in order to capture the light trails. It’s also recommended that you have some sort of shutter release or remote trigger. While you could trigger the camera by depressing the shutter with your finger, any additional movement to the camera is going to result in a blurry image. If you don’t have a shutter release or remote trigger, set your camera timer to 2 seconds. This way once you depress the shutter, it gives your camera enough time to stop vibrating before the image is snapped. Using the camera timer requires extra timing when it comes to capturing light trails, as you’ll have to press the shutter 2 seconds before the bus comes along. Be sure to set a mid-range f-stop, which will assure that all the elements in the image are shot from foreground to background. Keep your ISO low to minimize sensor noise. This image is a composite of several images, which I blended together in Photoshop. I fired off several dozen images until I got one with the light trails I wanted. Since pedestrians were constantly walking along the bridge during the shots, I chose another image with a couple leaning on the bridge railing and painted them in to my main exposure. At a shutter speed of 4 seconds, the face of the clock was blown out, eliminating the hands and numbers. I used an underexposed image of the scene and painted in the clock face, restoring the details.